The Black Cat: Devil Or Angel? ’Tain’t nothin’ but sorrow, ’tain’t nothin’ but loss. From Edgar Allen Poe’s unsettling and gory “The Black Cat” to the relatively innocuous Pyewacket from Bell, Book and Candle, the black cat’s status as a Halloween icon has a centuries-old history, and not a happy one. How did the sleek, shiny fellow—no different in disposition from a marmalade or striped feline—become a symbol of bad luck and death? “It’s a really, really long story,” said Denise Dumars, author of books about comparative mythology and the horror genre. 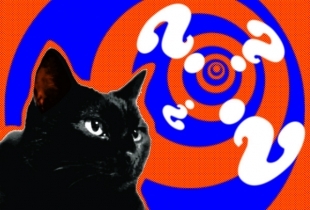 It’s certainly impossible to explain the mystique of the black cat without giving a history of the cat in general. We’ll attempt that here, but the history is as complex and mysterious as the cat himself, and we can offer only the pointed ears, tail and maybe a whisker or two. Long before Christianity, the cat sat regally in a place of worship in Egypt. They were given supreme status in the home and were bitterly mourned upon their passing. They had at least the same number of rights as a person—killing a cat, in fact, was punishable by the death penalty. According to The Cat and Man (G. Putnam and Sons, New York, 1974—if you’re a complete ailurophile and can find a copy of this book, you’ll get a detailed account of the cat’s rich history)—cats were worshipped by the Bantus and Masai as protectors of an entire tribe and were painted on battle shields to protect Roman soldiers. They were consorts of gods and goddesses in mythology: Dumars cites the two cats pulling the Norse sun goddess Freya’s chariot. The holiest of holy were putty in their paws—a tender vignette attributed to the Qu’ran describes how the Prophet Muhammad cut off the sleeve of his robe rather than disturb the sleep of his cat, Muezza, who was lying on it. Cats have populated literature and folktales, from the clever and unselfish Puss in Boots to the eerie changeling story of the man who married a beautiful woman who became a cat at night when her husband slept and came to a sad end when the husband killed the feline form. The pupils in their eyes mirroring the moon, their apparent ability to see things that we can’t, their agility and skill as hunters and leapers, their annoying and frustrating talent of hiding from you in plain sight—all of these things contribute to fascination with these mysterious creatures. So what happened, and who was really behind the dark forces that led to the persecution of a helpless animal? To start with, no one has ever been wishy-washy about cats and that, as Dumars said, people will hate cats for the same reasons that people love them. Add to this the combination of fear, ignorance and the ability of the powerful and greedy to manipulate those feelings with half-lies and rumors into mania and the association of cats, particularly black ones, with supposedly malevolent practices, and you have hysteria and the most inhumane persecution. With the advent of the Christian church and its subsequent takeover of pagan cults, the cat became, as it was, the goat. Paganism was demonized, and the female goddesses who related to felines turned into the feared Hag with Black Cat. Cats and other animals were believed to help do the bidding of their human associates—all true, says Dumars, but not in ways as nefarious as persecutors of practitioners claimed. Great numbers of cats and witches, particularly women, were oppressed, tormented and put to death during what Dumars referred to as the Burning Times, the period between the mid-fifteenth and early eighteenth centuries. Black cats suffered especially because of the European association of the color black with death, evil, night, shadows and the devil (one of the devil’s nicknames is, in fact, Old Scratch). 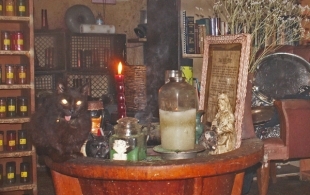 Jade, founder of Eye of the Cat on Broadway—Long Beach’s venerable shop and supplier for practitioners of the craft tradition—noted a nefarious sociopolitical connection: Witches were healers and midwifes, and the medical profession didn’t appreciate the competition. The church saw an opportunity for alliance with the medical profession to help rid society of what they saw as a threat to their power, and the physicians were only too happy to heal themselves of competitors. During the Burning Times, suspected and actual practitioners of the occult sciences along with their cats were tortured, burned alive, drowned, executed. Black cats, believed to be forms of the devil, were rounded up, bagged and immolated alive, hundreds screaming at one time as the fire consumed them. The terrible irony is that cats, who were seen to be witches in animal form, were the ones responsible not for demon casting but for disease control. With a diminished cat population, rats ran rampant and millions of people died of the Black Plague. For the survival of the cat, this was a hidden blessing. Cats would have probably been wiped out in Europe had it not been for the catastrophe, and so they were called back to duty. The Burning Times smoldered away in Europe, although they cropped up again in Salem and continue in a more benign form today, as characters in lights-out stories and hissy-fitters in cheesy horror films. The most recent feline deviltry are the online macropuss LOLcatz and their silly massacring of the English language. “I can has cheezburger?” Talk about an evil spell. We can’t leave the story of the cat without a few words about the familiar, especially on Halloween, when the veil is thinnest between this world and the other. The cat as familiar could be attributed to the lunar goddess, Diana, to whom the cat was sacred, and the cats’ pupils indeed wax and wane like the phases of the moon. In the charming French fairytale “The White Cat” (Mme. d’Aulnoy), the third son of a royal family was advised and protected by a beautiful snow-white cat, and the prince was able to overcome difficult obstacles and reach his destiny. Despite the cat turning into the expected enchanted princess at the end and the story’s allegorical nature, the cat acts as a familiar, and her color was white and not black, and her consort is a male. The familiar has counterparts in other cultures as well, and they’re not always cats. “As we’re learning more about pagan and European religions, we’re learning about their shamanic aspects—that there’s way more shamanic stuff than we realize,” Dumars said. One of the earliest Native American practices, the establishment of the animal totem, corresponds strongly with the idea of witches being able to turn themselves into cats. Dumars says that frogs, owls, goats, dogs and other animals may be familiars and cites the fabled Russian witch Baba Yaga, who lived in a house on chicken-leg stilts and kept many different animal familiars. 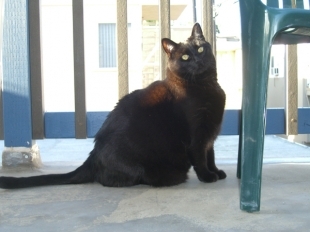 But there is something about a black cat… Jade has three of them. Are they familiars? And how can we get one? Jade also said that a familiar doesn’t have to take the form of a cat. Her sister has an affinity for rabbits and finds one on her doorstep read to come in and take over the house every time she moves. Jade’s beloved Merlin came to her in 1974 when she had just painted her shop, moved everything in and opened the door for the first time. “In comes this pussycat about 6 months old and jumps on the counter,” Jade said. “I said, who’re you, and he said, ‘Mrrrln’! I said, you need a home, young man!” Merlin was chief resident at Eye of the Cat for 20 years, when he passed. Today, there are more cats kept as pets than any other animal, including dogs, and many of them have it at least as good as their Egyptian counterparts. 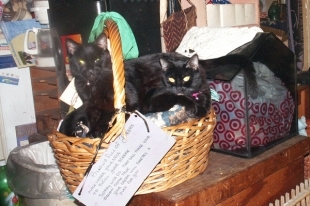 Black cats, however, still bear traces of the stigma of centuries past. They’re more difficult to adopt out, possibly because of a lingering atavistic terror. And then, there’s that apocryphal tale that’s resurrected every Halloween. For years now, rescues and shelters have refused to adopt black cats during Halloween for fear of their being tormented by 21st-century versions of the chief inquisitors of the Burning Times or being used as sacrifices by Satanists. Both Jade and Dumars feel that these reports are urban legends and pretty much nonsense chronicled on blogs, fanned, as always, by rumor. Mythbuster website Snopes.com states that there has been no documentation if any incidents by any legitimate source. HSUS’s outreach assistant, Michelle Cascio, concurred. Jade reminded us that there are too many horribly cruel people in the world, and they don’t just come out on Halloween. Whatever color your cat is, keep him or her indoors at all times. The cat has, magically perhaps, endured persecution and enjoyed worship and is still with those of us as blessings on the hearth and shedders on the sofa. We love them all, no matter what the season and no matter if they’re black, white, orange, striped, or any combination of color. Photo and design (top right) by Michelle Manion. Editor’s note: This story originally ran on October 30, 2009.